The ulitimate Economics [Macroeconomics and Microeconomics] resource featuring essential questions and explanations. Video lectures, graphs, concepts, and diagrams are included. Click on any topic on the right to get started or search any topic below. Awesome study aid for students taking economics courses. Great resource for teachers to use in their classrooms. In this No Bull Economics lesson, we discuss how to measure the responsiveness, or elasticity, of anything. This video refers to the price elasticity of demand, price elasticity of supply, income elasticity of demand, cross price elasticity of demand, wage elasticity of demand, wage elasticity of supply, interest rate elasticity of savings, and interest rate elasticity of borrowing. After looking at these basic elasticity formulas, you will definitely see a pattern! What is a budget constraint graph? The No Bull Economics video below introduces the concept of a budget line or budget constraint. In this example, an individual is deciding how many swimsuits and pairs of flip flops to purchase before beach season. A budget line is comprised of the different combinations of these goods that the consumer can afford. Te consumer can afford any combination on the line and inside the line, but cannot afford any combination outside the line. The main ideas behind an individual's budget line is similar to a constant-cost production possibilities frontier. A budget line looks at the different combinations of goods that an individual can afford while a production possibilities frontier looks at the different combinations of goods that an economy can produce. This is an excellent example of opportunity cost. To determine the utility-maximizing combination of goods to purchase, use this formula. Why study economic theories and models? When you learn economics for the first time, you are really learning a new way of thinking about the world. Economic theories and models can help us understand peoples' behaviors and how to approach and solve all kinds of problems. This No Bull Review video goes over the importance of marginal thinking, opportunity costs, incentives, and why developing economic theories and models are so important. How are AP Macroeconomics and AP Microeconomics different? The College Board (whether you love it or hate it) offers two Advanced Placement exams every May: one exam for Macroeconomics and one exam for Microeconomics. Macroeconomics looks at the economy as a whole with an emphasis on macroeconomic policies by the government and international economic matters. Microeconomics looks at individual markets and firms with more precision than the Macroeconomics course in the AP program. Students often ask me the question: "Which class is more difficult: AP Macroeconomics or AP Microeconomics?" The answer is that it depends on several factors. First of all, I find that students who excel in history, government, and social studies classes seem to understand Macroeconomics more than Microeconomics. This is because of the fiscal policy and monetary policy applications, as well as the differing economic and political theories that go along with these policies. My students that are stronger in math courses like AP Calculus tend to enjoy Microeconomics more than Macroeconomics. This is because these students recognize mathematical relationships - such as derivatives and integrals - within Micro models more than Macro models. However, knowledge in Calculus or advanced mathematical reasoning is not necessary in understanding AP Microeconomics. Another factor to consider is that some seniors taking AP Economics as a full-year class retain more information from whichever subject (Macro or Micro) is taught first. This is due to the dangerous second-semester sickness known as "senioritis." But, some seniors remember more from second semester than first because the content is fresher when the AP exams begin. There is no neat and clean answer as to which class or exam is easier. There is also no neat and clean answer as to which class students enjoy more. As an AP Economics teacher, I can't tell you which I like better because I love teaching and learning both Macroeconomics and Microeconomics to an unhealthy degree. Every year, I ask myself this question and it gets harder and harder to answer. If you have the option to take both AP Macroeconomics and AP Microeconomics, then do it! Learning to think from the economic perspective can improve your reasoning skills and life skills. If you don't understand the basics of eocnomics after your first semester or course, then take another economics class - it will click at some point. Some of my students are sponges that absorb all economic concepts immediately and can apply marginal thinking within seconds. For other students, everything clicks toward the middle of the course, the end of the semester, or even several years later (I have the emails to prove it!) . If you are taking AP Economics next year, I wish you the best of luck. If your teacher isn't that great or new to the subject, then know that you have an incredible support system on the Internet. YouTube has many excellent economics teachers that can show you all of the major economic models that are essential to mastering the Advanced Placement exams. How do you show the effects of a decrease in aggregate income using the foreign exchange market? Suppose one economy is in recession while another country’s economy is strong. The country in recession won’t be able to import as many goods since income is low. Therefore, it will supply less currency to the foreign exchange market. When this happens, the value of currency will appreciate. 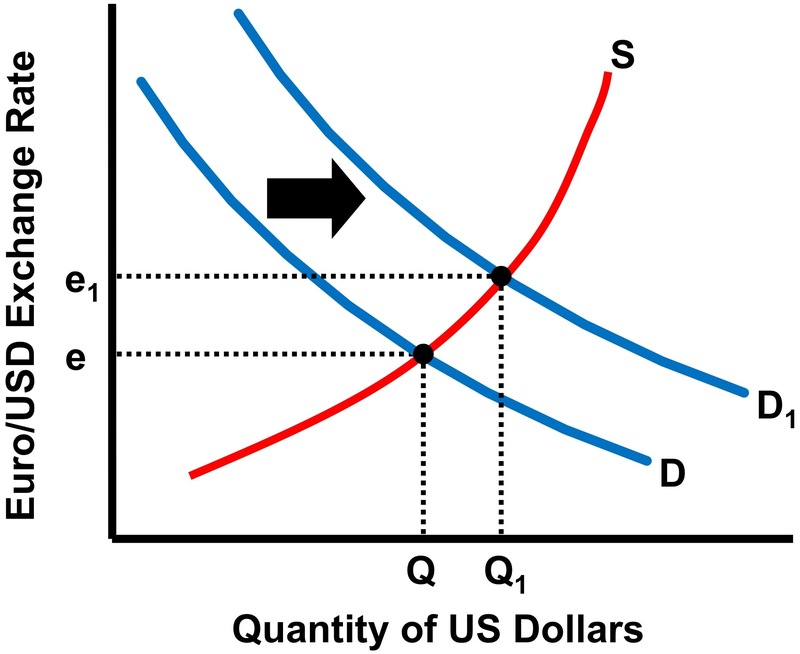 An exchange rate is determined by supply and demand in the foreign exchange market. It is how much of one country’s currency it takes to buy one unit of another country’s currency. For example, it might cost 0.73 euro to buy $1 US this month. If it costs 0.5 euro to buy $1 US next month, the euro has appreciated in value because it takes fewer euros to buy $1 US. This means that the dollar has depreciated against the euro. With the exchange rates from the example above, $1.37 US will buy 1 euro this month. Next month, it costs $2 US to buy 1 euro. Again, the euro appreciated and the US dollar depreciated. Exchange rates and the value of a currency are all relative. What are some barriers to international trade? In the long run, the gains from international trade are greater than the losses. In the short run, trade can hurt domestic producers and cause domestic unemployment, which can lead to the implementation of trade barriers by policy makers. One type of trade barrier is a tariff; a protectionist tool that taxes imports. This raises the costs of foreign goods to keep domestic industries alive. However, higher prices hurt consumers. Other tools of protectionist policy include import quotas (legal limits), complicated licensing procedures, and high quality standards. A more unfortunate barrier to trade is a global military conflict that cuts off supply lines between trade partners; or perhaps, a war between two trading partners. How does a trade deficit affect a nation's economy in the short run? A trade deficit occurs when a nation’s imports are greater than its exports. Net exports are negative and the current account is showing a deficit. When a trade deficit increases in the short run, aggregate demand shifts to the left. The price level decreases, real GDP falls, and unemployment rises. If a nation’s exports are greater than its imports, it has a trade surplus or current account surplus. When net exports increase, aggregate demand will increase. In the long run, exports and imports will balance out. What is the difference between a current account transaction and a capital account transaction? The balance of payments system keeps record of all foreign transactions. There are two main accounts in the balance of payments system, the current account and capital account. The current account consists of imports, exports, and foreign transfer payments. The capital account (or financial account) consists of real assets and financial assets. A real asset is property or a factory. A financial asset is a stock or bond. When foreign money flows into our current account as a result of an export, our current account is credited. When our currency leaves the capital account after purchasing a foreign apartment complex, the capital account is debited. If one account shows a surplus, the other will show a deficit. In the end, the two accounts should balance. What happens when the Fed buys or sells bonds? When the Fed buys treasury bonds, the money supply increases and interest rates fall. This increases investments and consumption spending. Aggregate demand increases, price level increases, and real GDP increases, and unemployment falls. When the Fed sells government bonds, the money supply decreases and interest rates rise. Investment and consumption decreases, aggregate demand decreases, price level falls, real GDP falls, and unemployment rises. The No Bull Review video below simplifies monetary policy and open market operations in less than 1 minute. It includes all of the necessary graphs associated with monetary policy action. How do you graph a foreign exchange market? To graph a foreign exchange market, you need to two different currencies to compare. For example, the market for US dollars needs to show how much of a foreign currency is needed to buy 1 US dollar. In the market for US dollars, the quantity of dollars goes on the x-axis. On the y-axis, you put the foreign currency price of the US dollar. In the No Bull Review graph below, we see the market for US dollars and how many euros it takes to buy a US dollar. This graph is showing a rightward shift of demand for dollars. This causes the US dollar to appreciate relative to the euro (and the euro depreciates relative to the dollar). It now takes more euro to purchase 1 US dollar, and fewer US dollars to purchase 1 euro. The value of a currency will appreciate when its demand shifts to the right or its supply shifts to the left. The value of a currency will depreciate when its demand shifts to the left or its supply shifts to the right. What factors will depreciate the value of currency? 1. Interest rates decrease - Foreigners will demand fewer bonds when interest rates fall (because foreigners will make less money off our interest-bearing assets). 2. Tastes and preferences for goods decrease - If foreigners demand fewer products produced over here, then the currency will depreciate. 3. Inflation increases - If prices are relatively higher over here than overseas, then foreigners will not want our goods and we will want cheaper goods overseas. 4. Incomes increase - If this economy is strong and foreign economies are weak, foreign economies cannot afford our goods. However, we can afford to purchase foreign goods. How do you graph a contractionary monetary policy? 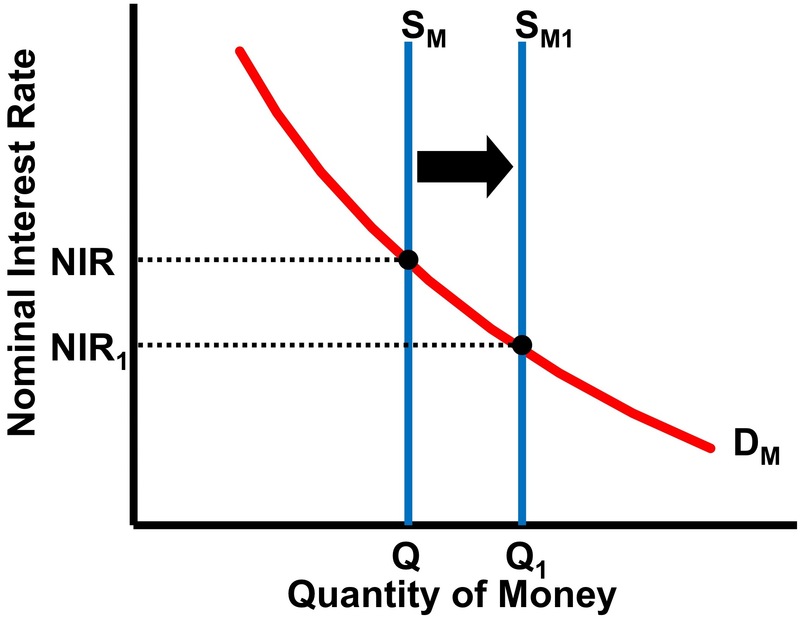 In the money market, you want to show a leftward shift of the vertical money supply curve. This will raise interest rates and decrease investment and consumer spending. As a result of the decrease in spending aggregate demand will shift to the left, decreasing RGDP, price level, and employment. The No Bull Review graph below shows a contractionary monetary policy in the money market. As you can see, the policy raises the nominal interest rate. How do you graph an expansionary monetary policy? 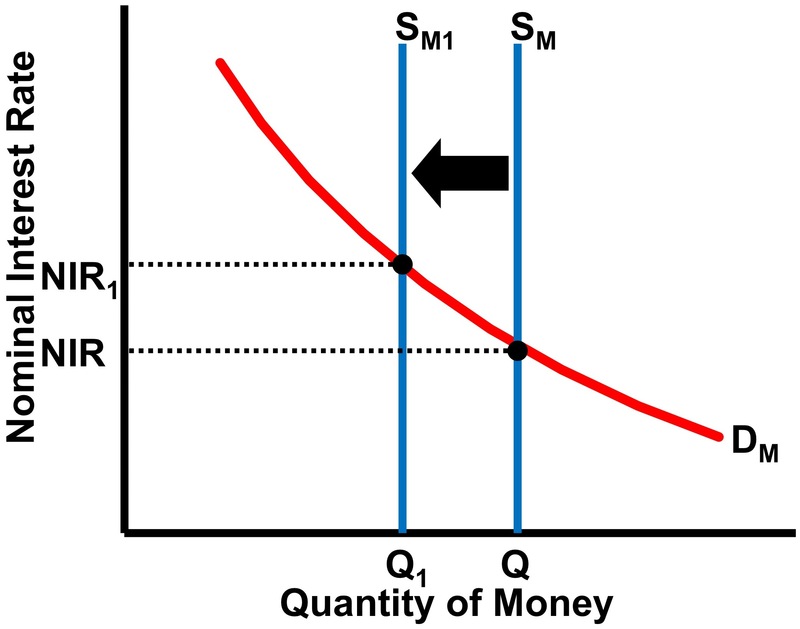 In the money market, you want to show a rightward shift of the vertical money supply curve. This will reduce interest rates and increase investment and consumer spending. As a result of the increase in spending aggregate demand will shift to the right, increasing RGDP, price level, and employment. The No Bull Review graph below shows an expansionary monetary policy in the money market. As you can see, the policy lowers the nominal interest rate. What are the tools of monetary policy? 1. Open Market Operations: When the Fed buys and sells government bonds (or securities) to change the money supply and interest rates. The Fed targets the federal funds interest rate (bank-to-bank interest rate for short-term loans) through open market operations. If the Fed wants to increase money supply and reduce interest rates, then it buys bonds. If the Fed wants to reduce the money supply and increase interest rates, then it sells bonds. 2. Discount Rate: The Fed can increase or decrease the interest rate it charges banks for short-term loans. When the Fed lowers the discount rate, the money supply increases. When it raises the discount rate, the money supply decreases. 3. Reserve Requirement: The Fed can reduce the reserve ratio, which means banks can lend more of its excess reserves to increase the money supply. It can also raise the reserve ratio, which reduces a bank's excess reserves and the money supply. Wild Card. Interest Paid on Bank Reserves: As a result of the Great Recession (2007-2009), the Fed began paying interest on bank reserves held at the Fed. As of 2014, this tool is still considered experimental and we do not know the true effects of this policy tool. How do you calculate marginal revenue product? Marginal revenue product (MRP) is the change in total revenue divided by the change in quantity of inputs. You can also calculate the MRP by multiplying marginal product (AKA marginal physical product) by the marginal revenue. How do you calculate the profit-maximizing combination of economic resources? The ratios must be equal to one. If you need the MRP / P to decrease, then hire more units of that resource. This is because of the law of diminishing marginal returns (as inputs hired increases, marginal product and marginal revenue product decreases). If you need the MRP / P to increase, then hire fewer units of that resource. How do you calculate the utility-maximizing combination of goods for a consumer? The ratios must equal one another. If you need the MU / P to decrease, then buy more units of that good. This is because of the law of diminishing marginal utility (as you buy additional units, marginal utility decreases). If you need the MU / P to increase, then buy less of the good.